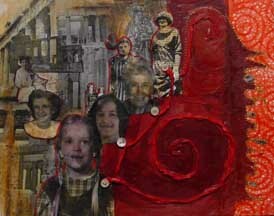 The collages in this gallery celebrate some members of my family, but they can become your "instant ancesters". These collages are not for sale, but they are available in print in either of two sizes, 8"x10" print, matted to fit in an 11" x 14" frame for $35, or 13" x 19" print matted to fit in an 18"x 24" frame for $45. My grandmother, Lorraine Grace South Young, was quite a woman! She had three daughters and a husband, but she left them to go alone to the Phillipines as a missionary before WWII. She built five churches there over a period of about 30 years. 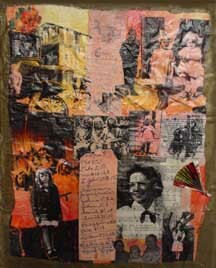 This bees' wax collage on 11"x14" canvas board includes images and transfers of her, her daughters, a sample of her penmanship, a page from the Bible, and a map of the Phillipines. Nina Katherine Young Marcom is my dear mother, who is still going strong at age 90! 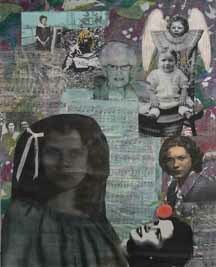 This collage shows Mom from her early childhood to young adulthood. To suggest her artistic nature, I used an easel, a tube of oil paint, and a frame. Red has always been her color, so I used Prismacolors to color many of her outfits in these black and white photo copies. Included also are pictures of her parents, her sisters, her husband, and her two daughters. This collage is finished with bees' wax over an 11"x14" canvas board. Elizabeth Lucille Young Thomas Simenson is two years younger than my mother. Orange has always been her color, so I used it to unify the composition here. In addition to pictures of Betty as a young girl and young woman, there is one recent picture of her with her two sons, a picture of her father in his WWI army uniform, pictures with her sisters, a bookmark of Grandmother's with scripture references, and a miniature fan because Aunt Betty has always been partial to Asian things. The border is Thai gold metallic paper. 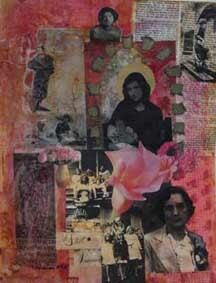 This bees' wax collage on canvas board measures 11"x14". Alice Lorraine Young Famularo is mother's baby sister. She has always been a curly-headed beauty! 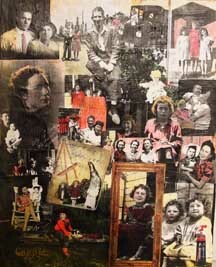 All of the pictures on this collage are of Alice, though one also includes her husband, Uncle Nofie. There is a hymn in the background, since Alice is very musical. The small peach is a family joke: Alice can't stand peach fuzz! The bees' was collage measures 11"x14". This collage was done for my daughter Erin. Her picture as a 4 year old is followed my her mother (me), my mother (Nina Katherine), my mother's mother (Lorraine), and my mother's grandmother on her father's side, and mother's great-grandmother. Behind my picture are Erin's great-grandmother and great-great-grandmother on my father's side. To the left of Erin are her grandmother and great-grandmother on Erin's father's side of the family. On the right side "Motherline" is stitched by hand in gold thread over rice paper. The red spiral in low relief is symbolic of femininity and the umbilical cord. The buttons? Belly buttons! The photos in the background are pictures we took of the Parthenon over 40 years ago. My father, Maynord L Marcom, was the fourth of eight children born to poor farmers in Oklahoma. Pictures of him before he moved to California at age 20, are few and far between. I included a transfer of the only snapshot I have of him with his brothers and sisters, five of his school pictures from elementary school and his high school graduation picture. In all his elementary school pictures Daddy was wearing overalls, so I found a strap and pocket to include. The pig is a reminder of an old family story from Daddy's mischieveous childhood. 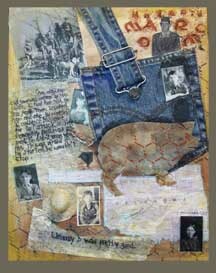 This 16"x20" collage is in a distressed wooden frame. Do You Have Old Family Pictures? Please contact me if you are interested in having me do a collage for you from your old photos. I work with laser copies of the old photos, not the actual photos, so your heirlooms remain in tact and remain in your hands. Email me if you are interested carlman@sbcglobal.net Prices are in the $300-$400 range for 16"x20".